20+ wines by the glass! We do not accept email reservations. Please read our reservation policy. Do you live on Cape Cod year round? Join our VIP club and earn coupons, discounts and more. Members login. Casual Fine Dining Restaurant serving Traditional and New American cuisine along with standard New England fare. Award winning wine list and unique 22 oz. craft beer selections. Gluten friendly. Open year round serving lunch and dinner. Limited reservations accepted. Walk-ins welcome. 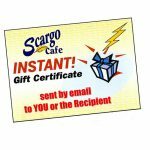 Scargo Cafe is at Scargo Cafe. Did you know Peter is obsessed with serving freshly baked bread to all our guests? No lie, he talks about it constantly. Have you ever tried it?? ?